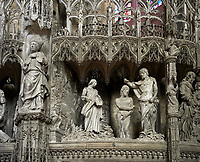 Pictures & images of the Medieval Gothic sculptures and statues of Chartres Cathedral France. One of the great Medieval Gothic Cathedrals of the Christian world is Chartres Cathedral which was constructed in 1194. The Cathedral of Chartres was built quickly over 26 years and has a coherence in its design that does not suffer from the endless alterations that other Gothic Cathedrals built over many decades suffer from. There are three public entrances to Chartres all of which have gothic portals decorated with gothic sculptures and bas reliefs. The West facade has 3 portals which make up the Royal portals. The tympanum above the central portal shows gothic sculptures of Christ in Majesty surrounded by the four Evangelist Symbols. The inner archivolt contains angels. On the two outer archivolts are the twenty-four elders of the Apocalypse. On the lintel are the twelve Apostles flanked by two other figures holding scrolls. The tympanum of the left door shows the Ascension or the Second Coming. Christ (crossed halo) stands on a cloud, supported by two angels. Below are four angels some of them have their mouths open . On the lintel below are ten seated men holding books or scrolls and looking upward. On the archivolts are the Signs of the Zodiac and the Labors of the Months, The Tympanum above the right door shows the Virgin and Child enthroned, flanked by angels. Both the North and Southern porches are as richly decorated with sculptures and bas reliefs depicting scenes from the Last Judgement. These narratives would have been very familiar to the medieval pilgrims as they passed through the portals into the Cathedral. The statues of Chartres have a very distinctive style being slightly elongated. The faces on the statues are also full of character and the flowing garments testify to the skill and creativity of the unknown craftsmen that were responsible for their creation. We have got used today to seeing stone decorations on the great Gothic churches so it hard to image them in their original painted state. The statue of Chartres still have paint fragments that show that they were once painted in bright colours that would have complimented the bright stained glass windows inside. The use of colour outside and inside these great Cathedrals goes against the dark picture historians paint of the middle ages. 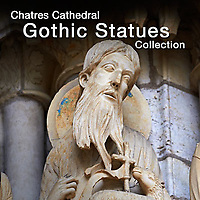 The sculptures of Chartres shows what a creative and inventive mind the Medieval artist had. His world was full of vibrant saints, apostles and strange mythical animals. The medieval world may have been a dangerous place but the imagination of the medieval man was not intimidated by worldly fears, and his passion for the glorification of God can be seen quite clearly in Chartres. A UNESCO World Heritage Site.